SM Forums / Lounges / Maya Basics & Newbie Lounge / How to install PyMel and Python scripts in Maya 2008? How to install PyMel and Python scripts in Maya 2008? What is this error and how to avoid it? 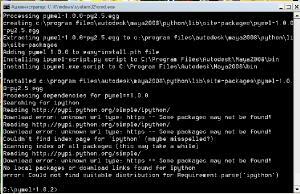 There in the documentations are several ways for manual installation of PyMel as a Python package, but I don't know Python (honestly, I have never dealt with it at all) and I don't know which is the best way to do it. If someone have ever worked with PyMel and Python scripts in older versions of Maya (2008-2010), where it wasn't included inside, how did you install PyMel?